I am half the size I used to be….well actually less than half, and yet I am also sooo much more than I used to be . In the photo on the left was May of 2012 when I was wearing size 26 shorts…and those shorts were so tight I needed to be in a 28. The photo in the center is when I was at my smallest in Dec of 2014 at a size 6-8. The photo on the right is me this 2nd week in May 2017 in one leg of the same shorts from the photo on the right. I am currently comfortably in a size 10. My size kinda fluctuates from an 8- 10 for the most part and I even got back up to a size 12 for a while after we moved to Alabama. In the first photo I am morbidly obese, in a moderately severe depression, barely on speaking terms with my husband and completely miserable. 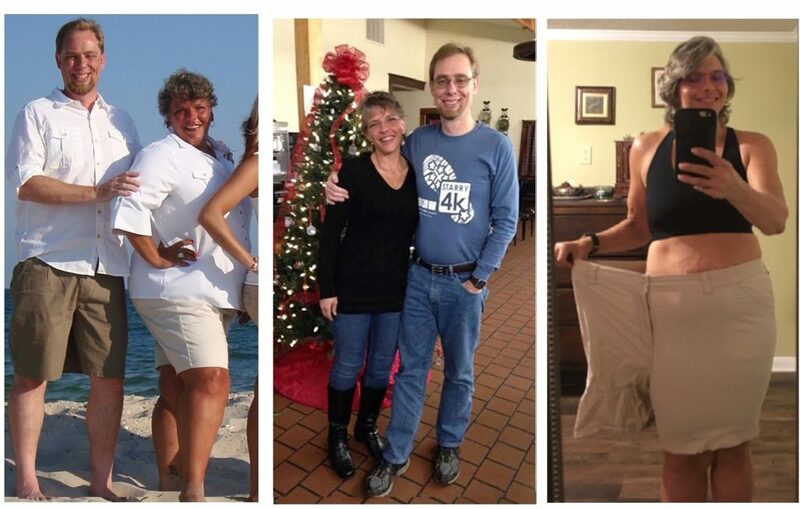 In the 2nd photo I am at the smallest I have been since I was about 21 years old, and while I was no longer depressed and my husband and I had repaired our broken relationship, I was still miserable. I was constantly chasing fat loss or trying to stay “skinny” I was on the arc trainer at least an hour a day in the mornings…at least 6 days a week and running for 20-30 minutes once or even twice a day…..AND lifting weights 4-5 days a week for 1-2 hours. So, in essence I was spending a minimum of 2-3 hours a day on exercise alone….sometimes more! My hunger was through the roof! I was constantly hungry and tired all the damn time. I was drinking 3 pots of coffee daily and was completely exhausted. I was super strict on my diet, was counting calories and macros and weighing and measuring every single bite I put in my mouth. I personally think I looked a good bit more than 2 years older than i look in my obese photo. How the hell did I do this? 4 things. Mindful eating, moderate exercise and most importantly a mindset change and the patience to accept that I have to take the time to create healthy habits in small increments instead of having an all or none approach or being on a diet all the time. No more extremes. Doing one single thing that is just a little better than what we are doing right now and doing it every single day is much better than trying to do a complete overhaul of everything. Using an all or none approach or going on a diet, is actually setting ourselves up for failure. It is easy to do for short while and maybe even a few months if we are super disciplined, but eventually unless we have a plan in place when the diet is over, will more than likely revert to old habits just because they are familiar, for the sake of convenience or because we do not have the tools and strategies in place to create a lifestyle instead of being on a diet for a while. I gave you one of the tips above. What is one thing either nutrition, exercise or mindset wise that you can incorporate into your routine every single day that is just a little better than you are doing now? Don’t have a clue? Would you like some help? just ask.